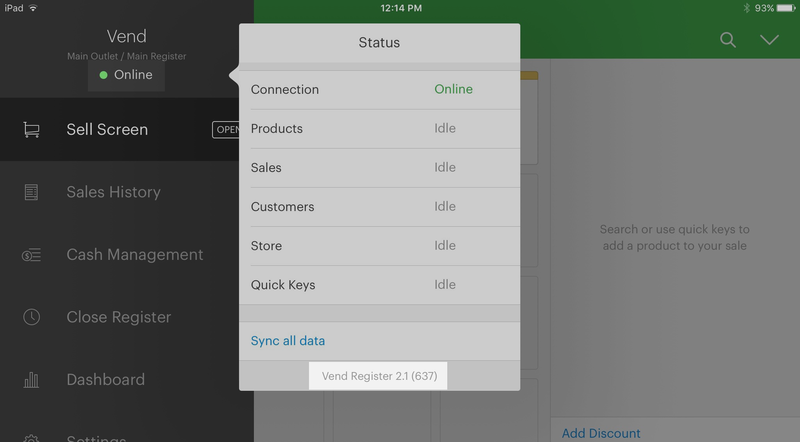 Checking the Version of the Vend Register app for iPad – How can we help? If you are having any issues with Vend's iPad Register app, it may be specific to the version of the app you are currently using. Because of this, it can be very useful for our support team to know which version of the iPad Register app you are using before they troubleshoot the problem. To find out your current version number, open the iPad Register app and click on the menu (three horizontal lines) button on the top left-hand side of the screen. Once here, tap the green 'Online' icon at the top of the menu bar. Tapping this button takes you to the Status window. Displayed at the bottom of this window are the words "Vend Register" followed by the current version number of your app.